My cousin Lisa and I had planned on climbing the Direct Exum, but upon seeing the mountain, Lisa decided that the Grand Teton was too ambitious for her. I hiked up there anyway, in hopes of finding a partner, and ended up joining a group of 3 other climbers. We did not do the classic Direct Exum, but we had a fun climb nonetheless. The Grand Teton from the road through Teton National Park. The Exum ridge is on the other side. 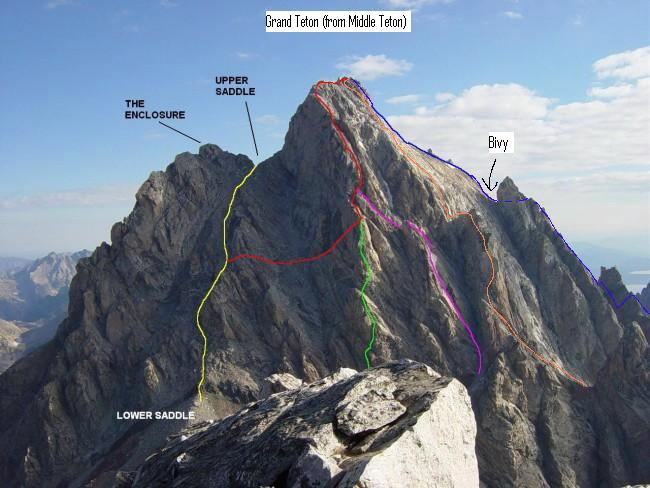 A great photo I found here on Sam Page’s site showing some of the routes on the Grand Teton. YELLOW: Owen-Spalding; RED: Upper Exum; GREEN-RED: Direct Exum; PURPLE-RED: Petzoldt; ORANGE: Underhill; BLUE: East. I had wanted to climb the classic Direct Exum route, but when Lisa decided not to climb the Grand Teton, I changed my plans to the Upper Exum route, which was a lot of fun as well. The Upper Exum route, with the approximate locations of the various named features. This is a popular route, starting with some Class 3 and 4 scrambling up the lower Owen-Spalding route, traversing a Class 3 ledge called "Wallstreet" to gain the Exum Ridge, and climbing the Upper Exum Ridge (Class 4 and low Class 5) to the summit. 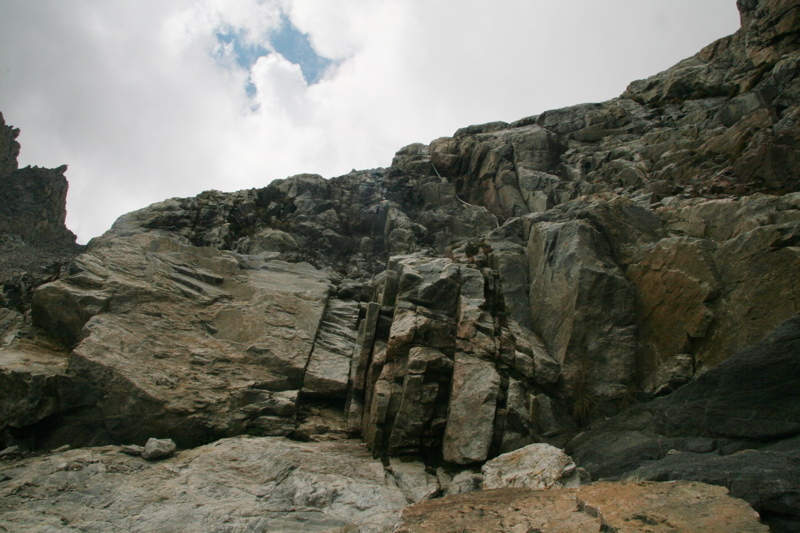 Most people then descend the Owen Spalding route, which involves 2 rappels and Class 3 scrambling. All summer, my cousin Lisa and I had been trying to get together for some climbing. Finally, on September 1, with the summer nearly over, we headed out on a 10-day road trip to Wyoming. We spent a few days having a blast climbing in the Cirque of the Towers, and then climbed the Grand Teton before heading back home. 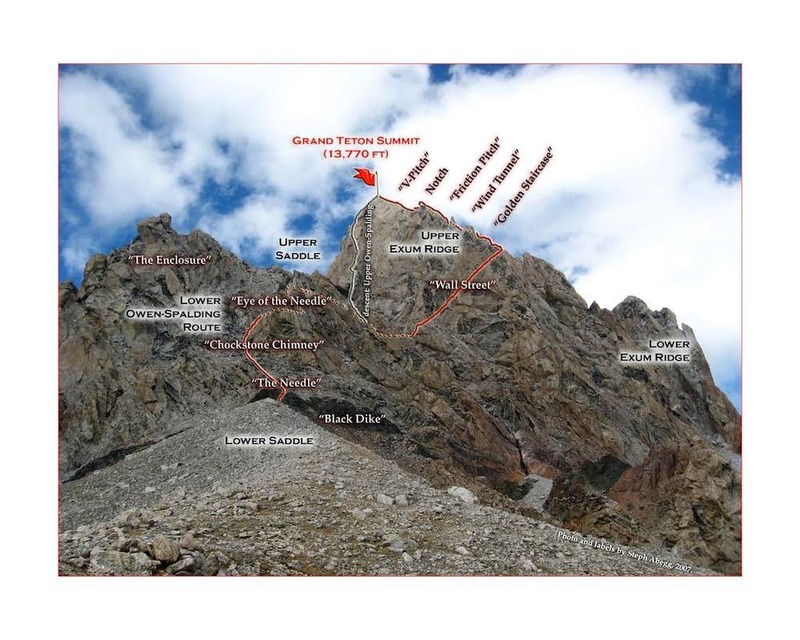 The following page details my climb of the Grand Teton (which Lisa decided not to climb). Click this link to see the trip report for our 2 classic climbs in the Cirque of the Towers (the East ridge of Wolf’s Head and the NE Face of Pingora). I ended up camping in the Moraine, due to high winds at the Lower Saddle. There was a party of three camping in the Moraine, and I decided to talk to them and see if they would be willing of taking on another climbing partner. They struck me as friendly and fun people. Although they were planning on climbing the Upper Exum rather than the Direct Exum, I figured it would be safer and more fun to climb with other people, so I set up my tent nearby and planned to head up with them the next morning. At 6am on Sept 8, the four of us (Willy, Marco, Lorna, and I) left our base camp in the Moraine and began our ascent of the Grand Teton looming above. We scrambled up the lower Owen-Spalding route and traversed over to the Exum Ridge via a ramp called Wallstreet. This part of the climb was little more than a steep hike with some fun routefinding. Then we climbed the Upper Exum Ridge to the summit. This was a lot of fun 4th Class and low 5th Class (up to 5.5) climbing. It was a fun route, we had great weather, and the conditions on the ridge were good. We descended down the Owen-Spalding route, which did have some snow and a bit of ice in the rappel chimneys, but not enough to be treacherous. It was a great climb! I had a lot of fun climbing with Willy, Marco, and Lorna. Thanks guys for letting me join your trio! Scroll below for trip reports and photos from the Upper Exum route on the Grand Teton. The approach to the Exum Ridge of the Grand Teton begins at Lupine Meadows Trailhead (6730ft). The total elevation gain from trailhead to summit is 7040ft. There are several places to camp along the way: (1) Platforms at 9000ft, (2) Meadows at 9300ft, (3) The Caves at 9700ft, (4) Moraine at 10,800ft, or (5) Lower Saddle at 11,600ft. The Lower Saddle is about 7 miles from the trailhead. I got a permit for camping at the Lower Saddle (you have to get a permit for camping in the area), but when I got up there it was so windy I retreated back down to the Moraine camps. It took me about 4 hours to get to the Lower Saddle from the trailhead. Free camping in Grand Teton National Park the night before the climb…. The Lower Saddle (11,600ft) from the Meadows (9300ft). The Middle Teton is on the left, the Grand Teton is on the right. I initially set up camp at the Lower Saddle, but moved down to the moraine due to the high winds at the saddle. Rosy Finch on the hike up. This photo shows the steep area just below the Lower Saddle. There is a fixed line (right-center in photo) that makes it easy to ascend. Marmot at the Lower Saddle. There are boxes or hangers to keep your food away from these critters. I initially set up camp at the Lower Saddle. However, even behind the boulder I found, it was so windy I knew I would never get any sleep, so I packed up and moved my camp back down 1000ft to the moraine camping sites. My camp in the moraine below the Lower Saddle, with the Grand Teton looming behind. It was windy still, but much less windy than at the saddle above! This is where I met Willy, Marco, and Lorna, who I teamed up with for the climb. We scrambled a little less than 1000 vertical up the lower Owen-Spalding Route and then traversed over to the Exum Ridge via a ledge called "Wallstreet." 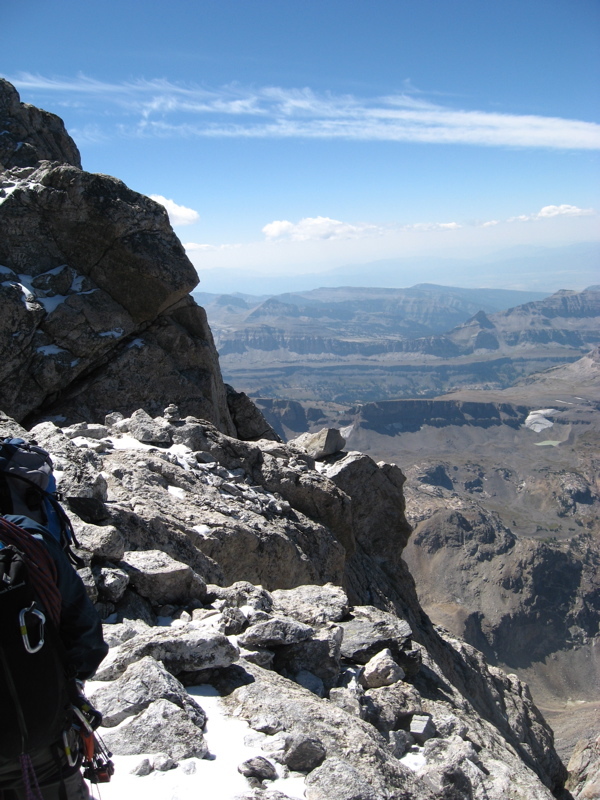 This is a popular route which bypasses the "harder" climbing on the Lower Exum Ridge. (I had wanted to climb the Lower Exum Ridge, but had to make some modifications to the plan when Lisa decided not to climb.) The Owen-Spalding route is little more than a steep hike, but has some fun route-finding around such features as "The Needle," the "Eye of the Needle," and "Wallstreet." The Wallstreet ledge brings you to the Exum Ridge. From here, the Upper Exum Ridge stretches about 1500 vertical feet towards the summit. Moon and planet the morning of the climb.. Morning sun on the Middle Teton. Morning shadow of the Grand Teton on the formations (mountains?) to the west. To begin the Direct Exum Route, you cut off to the right here. This photo shows the beginning of the Owen Spalding route. There is a trail that leads over the "Black Dike" (the black rock in the photo) and then leads left of "The Needle" (the pinnacle in the center of the photo). Then you traverse over the top of the "Chockstone Chimney" and over to and through the "Eye of the Needle." Ascending a trail on talus to the climber’s left of "The Needle" on the lower Owen Spalding Route. Lorna standing by the "Eye of the Needle," which is a tunnel behind a boulder near the top of "The Needle" that you crawl through. Scrambling over a boulder just after the "Eye of the Needle." Looking over at "Wallstreet," which is a ramp leading onto the Exum Ridge. It’s an easy traverse on trail from where this photo was taken to "Wallstreet." Ascending "Wallstreet," an easy Class 3 ramp to gain the Exum Ridge. Willy making the exposed Class 5 move at the gap between "Wallstreet" and the Exum Ridge. Most parties probably rope up here, but it’s more exciting if you don’t! The Upper Exum Ridge is about 1500 vertical feet of 4th Class scrambling and low 5th Class climbing. Like the Owen-Spalding route, it is riddled with named features such as "The Golden Staircase," the "Wind Tunnel," the "Friction Pitch," and the "V-Pitch." It was fun climbing, especially since much of it is in the sun. It could easily be soloed. Lorna and Marco at the first belay on the Upper Exum Ridge. This is where "Wallstreet" meets the Exum Ridge. It was nice to be in the sun! Willy leading up the "Golden Staircase" pitch at the start of the Upper Exum Ridge. This is easy 5.4 knobs. Lorna coming through the "Wind Tunnel" which is a couple of pitches (with the occasional low-5th move) leading up a grove near the ridge. It was kind of cold and windy, as it’s name might suggest…. Nice views on the way up, looking southwards towards the Middle Teton. We had great weather! Willy climbing up the easy 5th class rock between the "Wind Tunnel" and "Friction Pitch." Marco is belaying below. Looking up the "Friction Pitch." 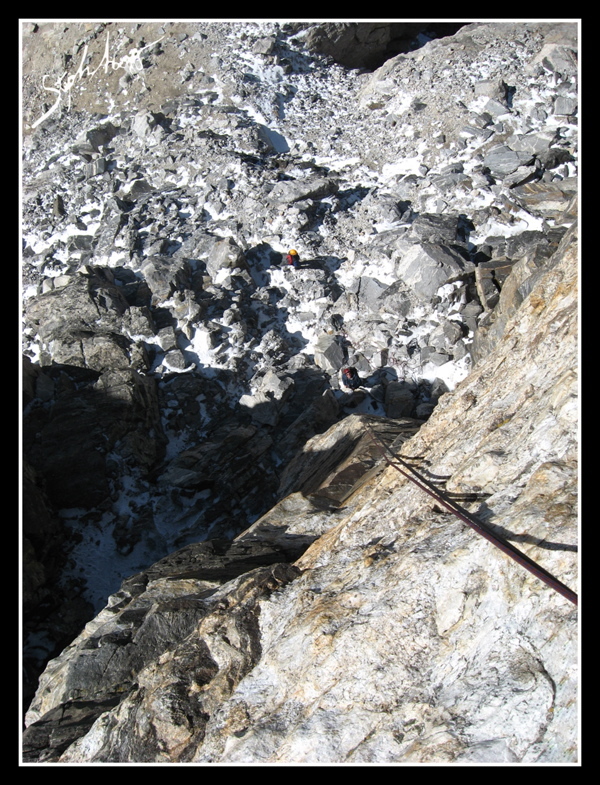 You climb towards 2 knobs located near the center of the photo, and above this is an unprotected "crux" 5.5 move. The rock is pretty textured, so it is pretty easy, even in approach shoes (which is what we were wearing). A pinnacle just before the summit ridge. There were a couple of fun moves climbing over the prow of this pinnacle. Easy scrambling towards the summit. Summit Photo. Back row: Steph, Willy. Front row: Lorna, Marco. View north from the summit of the Grand Teton. 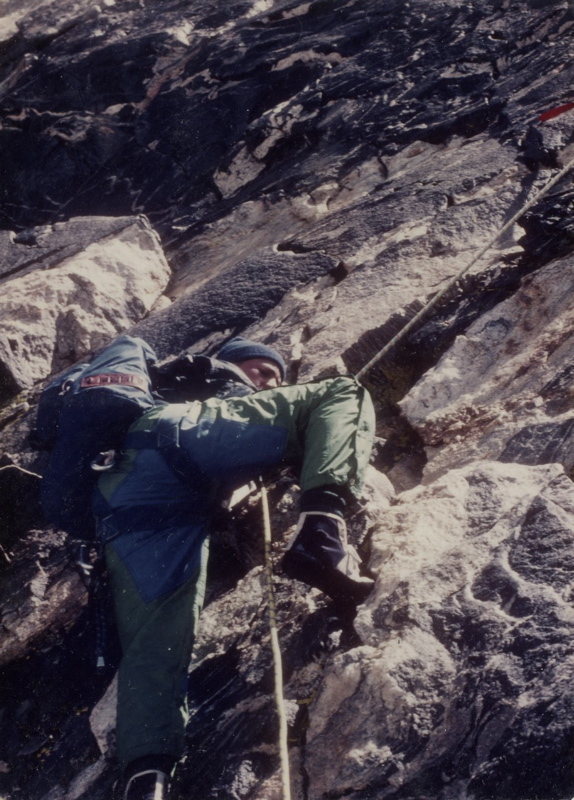 The typical means of descent is down the Owen Spalding route, which is mostly Class 3 scrambling. There are 2 rappels down the chimneys on the upper Owen Spalding route. To get to the first rappel you scramble down and left about 600ft. The second rappel is a short scramble down and left from the base of the first rappel. Due to a couple of early September snow storms, there was a bit of snow on the upper Owen Spalding route, but not enough to make it treacherous. Overall, the descent was straightforward, but in poor weather conditions I can see how the rappel anchors might be difficult to find. Beginning the scramble down to the first rappel to the skier’s left. There was a bit of snow on the upper Owen Spalding route, but not enough to make it treacherous. The first rappel is marked by a cairn, as shown in this photo. There are nice rap rings at the second rappel on the descent down the Owen Spalding route. If you use this rappel, you want to make sure that you have 2 ropes, since it is a 40m hanging rappel. There is a way to rappel using a single rope, but this requires rapping from a different rap anchor and using an intermediate anchor. Looking down the second rappel on the descent down the Upper Owen Spalding route. I wonder how many times climbers have thoughtlessly tried to rappel with one rope and ended up dangling in a rather serious midair predicament…. 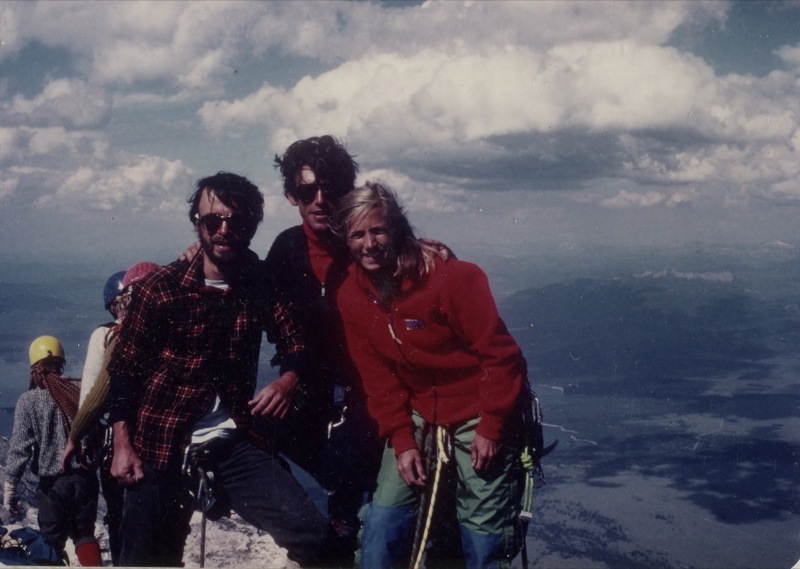 My parents climbed the Direct Exum route on the Grand Teton in August 1982. They teamed up with a guy named Ralph, whose partner had decided not to climb. These old climbing photos seem to be pretty popular in my previous trip reports, so I have posted a few from my parents’ climb in 1982 just for fun. 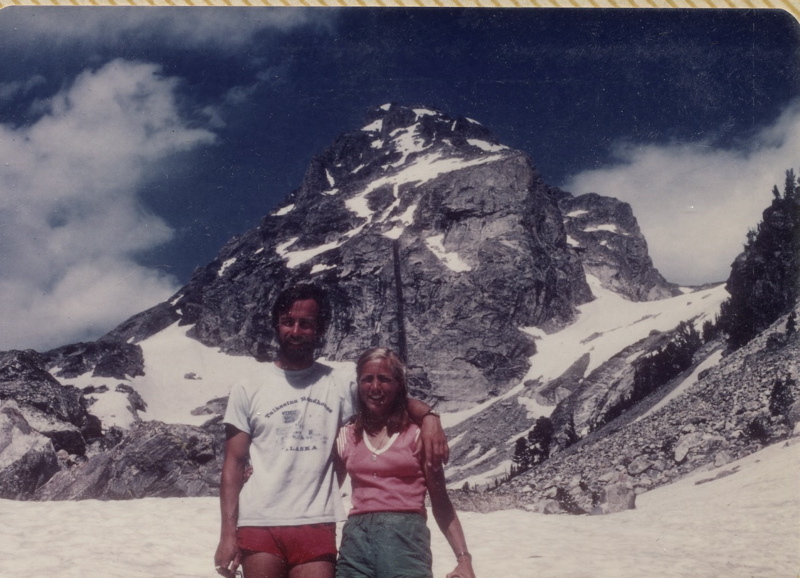 My parents below the Middle Teton, with the Lower Saddle on the right. My mom on The Black Face on the Lower Exum Ridge. On the summit. From left to right: Marty (my dad), Ralph, Sue (my mom).